This year, Bread Ahead will be celebrating Christmas 2017 with a selection of seasonal gifts and Christmas products. 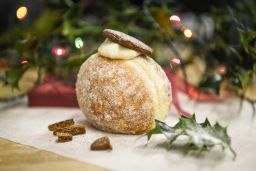 There will be gift vouchers for their baking workshops – with some newly announced Christmas classes such as the ultimate Christmas baking workshop as well as classics such as Italian baking and sourdough courses - and a brand new, limited edition Christmas Pudding doughnut adorned with a gingerbread biscuit star and rolled in cinnamon sugar. Bread Ahead’s signature mince pies will also be back on the stall, available to buy ready to take home and enjoy.